CatEye makes some of the most reliable and visible bike lights on the market, ensuring you stay safe when you're riding around town at night. 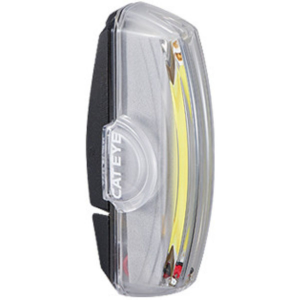 Designed for the urban commuter and dedicated cyclist putting in serious miles after dark, the CatEye Rapid X Light maximizes your presence to passing traffic with its powerful red illumination and numerous flashing modes. It features a USB-rechargeable battery that lasts up to 30 hours on its lowest flashing setting, as well as an Auto Save function that automatically turns the light to its flashing mode to extend battery life when it's running low on juice. The rubberized seatpost mount attaches to posts and bars ranging from 12 to 32 millimeters in diameter.